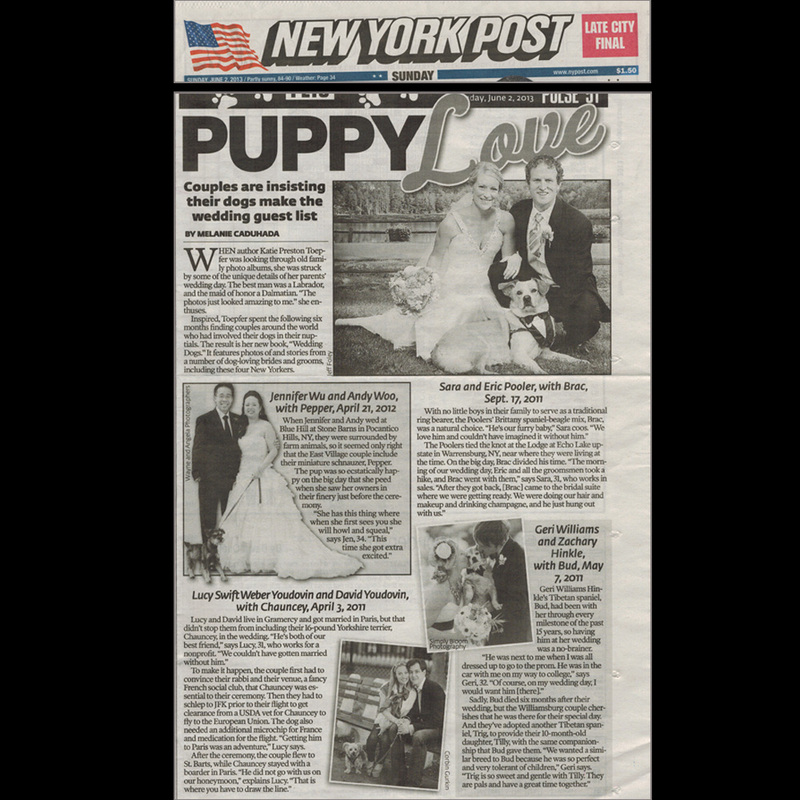 WEDDING WEDNESDAY: Tim and Leland in the New York Times! Congratulations to Tim and Leland who tied the knot last weekend in Nashville, Tennessee! We are so happy we could be your official engagement shoot photographer! Take a look at the link below for the couple’s wedding announcement in the New York Times. WEDDING WEDNESDAY: We are looking forward to celebrating with Daryl & Dan this weekend at The Estate at Florentine Gardens! 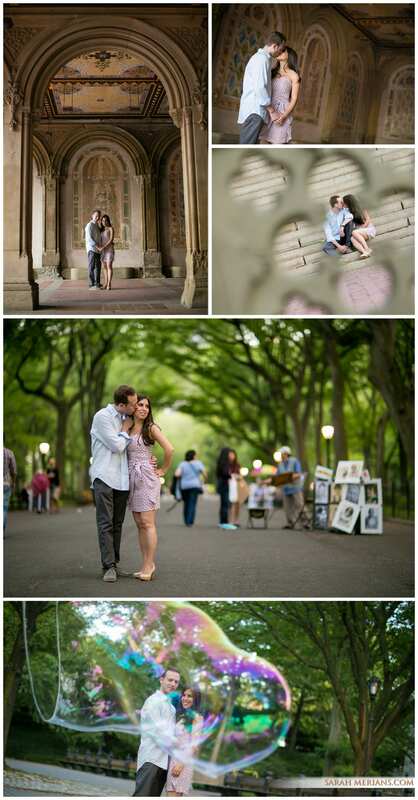 Take a glimpse of their beautiful Central Park engagement shoot with their photographer, Liel, below. It was a really fun day. Congratulations, Daryl & Dan! Rachel and Will came to our studio for a few indoor engagement shots before heading out to the High Line. It was just sunset when Sarah, Rachel and Will arrived at 14th Street. What a sunset it was. A really great time was had by all and we can’t wait to celebrate with the happy couple at their wedding next year! Heather and Seth are getting married! We photographed the beautiful engagement party in their honor at Tribeca Grill in downtown Manhattan! It’s always great seeing Seth and his family. We can’t wait for Seth’s sister’s wedding this fall. Congrats to the whole family and all the engagements! Congratulations, bride and groom to-be Margaux and Ryan! We are looking forward to celebrating with you and your families at The Pierre Hotel on Saturday night. We wanted to share a compilation of the great photos from your engagement shoot at our studio. Enjoy! Carrie and Ian celebrated their engagement with their closest friends and family at the University Club earlier this month. Sarah Merians was there to capture the memories and all the great speeches. Congratulations to Carrie and Ian who will be tying the knot in Hong Kong over Thanksgiving weekend! Bride and groom to-be Julie and Nolan met their photographer Leo at our Manhattan studio for a great engagement shoot. The couple posed against our brick backdrop here at the studio and went outside on Park Avenue for a stroll. Julie+ Nolan= True Love! We can’t wait for their wedding day this fall! Did you see this New York Post article from Sunday, June 2nd? Are you planning to have your dog walk down the aisle when you tie the knot? Here at Sarah Merians Photography & Video Company, we’re pet-friendly, too! Come to our studio for your pre-event shoot with your puppy or let us photograph your little one at your home or in a local park! 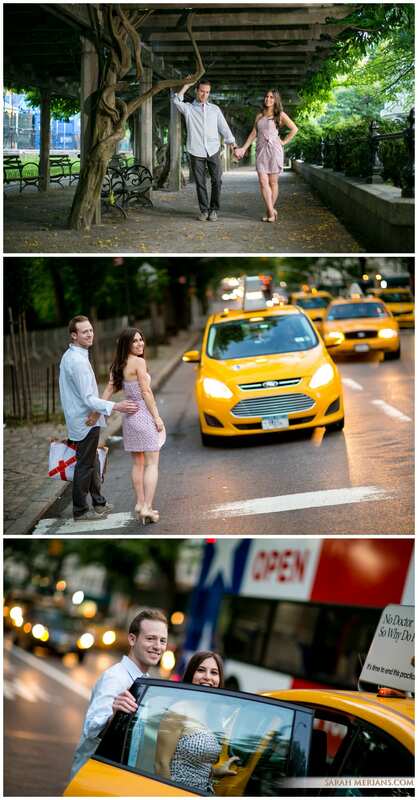 Photographing a bride and her fiancé around New York City simply makes us smile! Sara and Daniel tied the knot this past August. Stay tuned for photos from their wedding day. Congratulations, Stephanie and Jordan! We’re excited to be a part of your wedding day this Saturday. Take a look at some of the couples’ engagement shoot photos below. You can see the Empire State Building in one of these! We love NY! 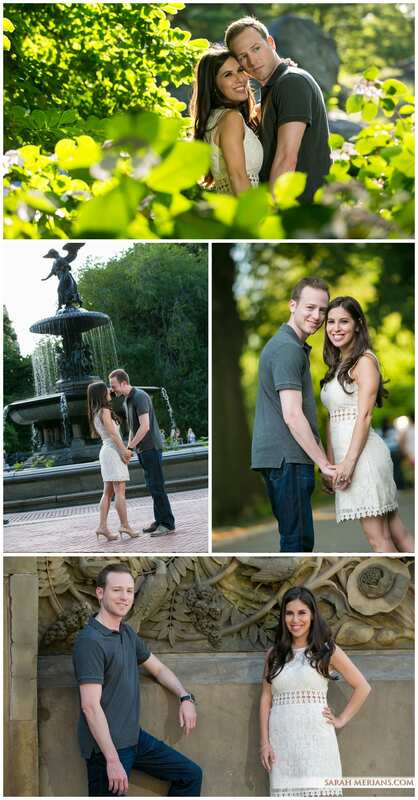 Ali + Brian+ NYC Summer= Love… and Great Photos, too! 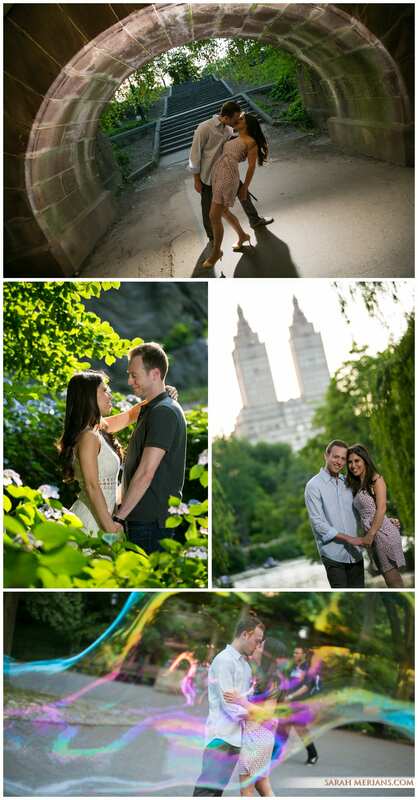 Ali and Brian got close at their Central Park photo shoot. The gorgeous blue sky and fresh purple park flowers didn’t deter from the happiness of the day at all, either. 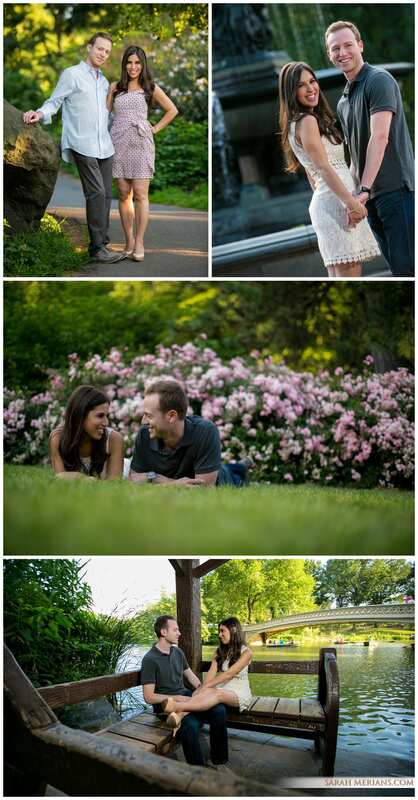 Photographer Leo followed the couple around, snapping photos of them enjoying a leisurely romantic stroll in the park. We wish Ali and Brian a “Congratulations” and we can’t wait for their fall wedding!